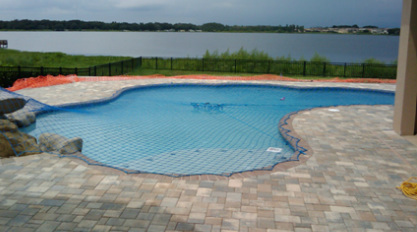 USA Pool Safety Products of Orlando offers a top quality ASTM certified Pool Safety Net. This pool safety Net offers an unobstructed view of your backyard pool, spa, pond or water features. They are designed to keep your kids out of the water while preserving your space and view in your backyard. This Pool Safety Net is A.S.T.M compliant and are proven to provide your child's safety around pools. It also meets or exceeds all Florida Barrier code requirements. We recommend you place your Pool Safety Net back on your swimming pool once you're finished swimming and or if adult supervision is not present.